The World Head of the Ahmadiyya Muslim Community, the Fifth Khalifa (Caliph), His Holiness, Hazrat Mirza Masroor Ahmad arrived in Malmo, Sweden on 10th May 2016 after completing a 6-day visit to Denmark. 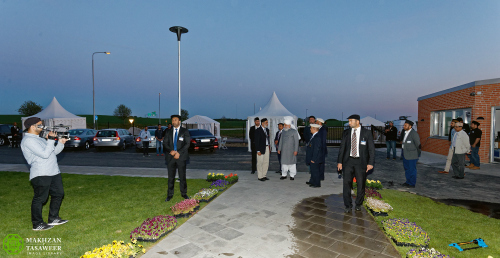 His Holiness travelled to Malmo by car and after crossing the border into Sweden was escorted to the newly built Mahmood Mosque, where he was greeted by the National President of the Ahmadiyya Muslim Community in Sweden, Mr Mamoon-ur-Rashid and hundreds of other Ahmadi Muslim men, women and children. 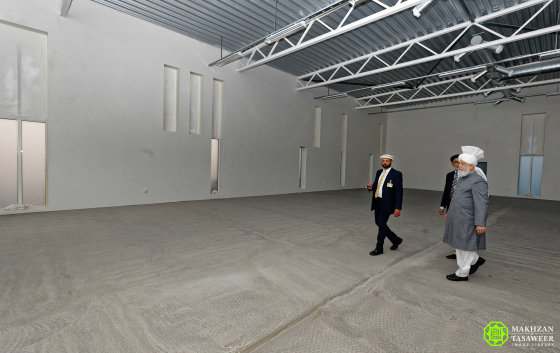 Later, His Holiness inspected the Mosque premises before leading the Maghreb and Isha prayers.During his visit to Sweden, His Holiness will formally inaugurate the new Mosque with his weekly Friday Sermon and will also address receptions being held to mark his visit. His Holiness will also meet various dignitaries and politicians, hold a number of media interviews, as well as personally meeting with Ahmadi Muslims living in Sweden. Share the post "Head of Ahmadiyya Muslim Community arrives in Sweden"